Maximize your outside time and grab a table in the sun. Choose a line leader and hit all three. Although with views like this, you may not get much reading done. See who can make the biggest splash at the end. Choose from three, both indoors and outdoors. Your kids will have a blast at the water park. Don't let the weather stop you from enjoying a swim – there are 2 indoor pools. Relax and unwind with a drink. Compass Cove Resort is located on the southern end of Myrtle Beach, close enough to the best attractions that Myrtle Beach has to offer but far enough away to enjoy some peace and quiet. After dropping off your luggage in your condo, get changed into swimsuits, grab pool toys and water wings, apply sunscreen and get ready to be amazed. The resort goes all out in the aquatics department offering a wide variety of underwater fun. Pool-hop your way through all 6 Pools (4 Outdoor & 2 Indoor) before picking your favorite. Enjoy a refreshing cocktail at the beach-side tiki bar. The 7 Hot Tubs are perfect for relaxing after a long day. Little ones will have a blast at the 5 children’s pools and the water playground for kids. But wait, there’s more! The water park with 3 lazy rivers & 2 water slides is sure to be a big hit. Need a caffeine fix? The on-site coffee shop, Compass Joe, has you covered. Excuse yourself from kitchen duty now and then and dine at the 2 on-site American restaurants. Get your cardio on at the 24-hour fitness center. The resort’s prime oceanfront real estate treats you to easy beach access as well. Load up on frisbees and footballs and go. Studio condos sleep two guests. Kitchenettes have what you need to make the basics. One-, two- and three-bedroom condos sleep six to eight guests. Full kitchens have everything that you need to whip up anything from sandwiches to multi-course meals. Stop by Food Lion to stock up on groceries. Bring the kids along to ensure that no one’s favorite snacks are forgotten. Spacious living areas with plenty of room for the kids along with their toys, blankets and games. TVs with DVD players are perfect for family movie night. Bring favorite movies from home or browse the selection of free DVD rentals available at the resort. Pop some popcorn and call everyone into the living room. First kid on the couch gets to choose the movie. So what will it be – The Lion King or Frozen? When your vacation is over, the last thing you’ll want to do is laundry. Good news, the resort has coin-operated laundry facilities, so when you arrive home all you’ll have to do is unpack. 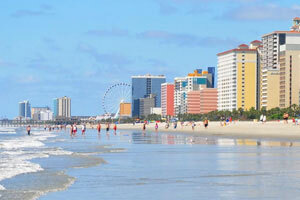 The Myrtle Beach Boardwalk is just a short drive from the resort. Take a ride on the Myrtle Beach SkyWheel. At almost 200 feet tall, it provides a spectacular view of Myrtle Beach and is an exciting adventure that everyone in the family can experience together. The Children’s Museum of South Carolina allows children to use their imagination through interactive exhibits. They will have so much fun that they won’t even notice it’s educational. They can be a paleontologist at the South Carolina Fossil House, a bank teller at The Big Bank or a doctor at the Kidz Medical Center. Broadway at the Beach is one of the most popular tourist destinations in Myrtle Beach and features shopping, dining, attractions, and entertainment for all ages.